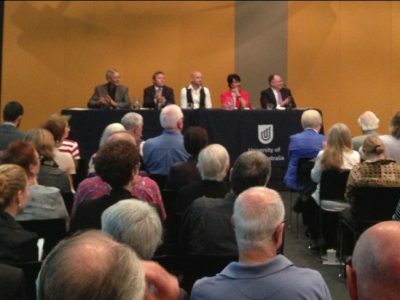 It was standing room only at the Heritage forum hosted by the National Trust at UniSA’s Hawke Centre on Wednesday night. The forum posed the question: Has South Australia given up on heritage? A five person panel chaired by Professor Norman Etherington, President of the National Trust, debated the proposition before a room filled to capacity. The event was also the occasion for the launch of this website as a place to continue the heritage debate. For those who missed the event, you can listen to the podcast from the Hawke Centre.